More than 20 million mobile phone users in the US received a message. 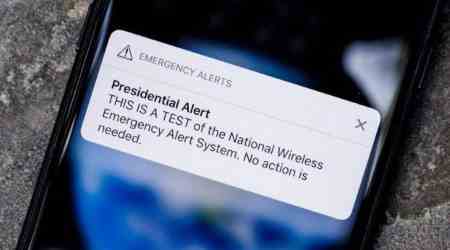 The message 'Presidential Alert' notification sent by US president Donald Trump The message was sent to check the emergency messaging system. This information was given in a BBC report. The user will not have any method of preventing sending such messages like the message of natural disaster. This message will not come only if the phone is closed or the mobile network is closed. Although many call it a 'trump alert', it does not directly associate the US President. It is being managed by the Federal Emergency Management Agency (FEMA). They will control this process directly to the President of Donald Trump. The message will be sent to be alert about emergency threats. Emergency threats include missile attacks, terrorist activities, natural disasters etc. There was a word while sending this message and the book was written on 'This is a test of the National Wireless Emergency Alert System. No Action Is Needed ' The system was launched in 2015. It is said to be tested once every three years. Although it was supposed to be launched in September, it was decided to test later to avoid misunderstanding among Hurricane Florence people. The US Congress has set limits on the prevention of abuse of this system. It has been given the importance of using natural disasters or public safety. After receiving the message, there are mixed reactions on Twitter and Facebook. Many people questioned the importance of sending such a warning message. Many people also said they did not get the message. Some have joke about this. A group of three, including a journalist, asked to file a lawsuit against Fame. They say that this method violates their rights. They are not forced to listen to the government. In addition, they complain that this test can have a serious impact on children and they have the opportunity of abuse.